Sherry, dark chocolate, christmas cake, almonds, toffee and oak. Oak and sherry notes sustain, mingling with hints of leather. Purchased from Cadenhead’s [http://www.wmcadenhead.com/] whisky shop on the Royal Mile in Edinburgh. After attending the launch symposium for the Anne Rowling Regenerative Neurology Clinic held at Our Dynamic Earth I decided to drop by on the way home through Edinburgh and see what was on offer. After a brief chat with the guys in the shop I sampled a little of the Calvados finish Springbank that had a beautiful apple brandy aroma but I wasn’t sure how well the Calvados finish translated into the taste of the whisky. Following this I opted for the Springbank 15 year old as a fine example of a Sherry maturation of Springbank’s distillate. Yes I most definitely would. 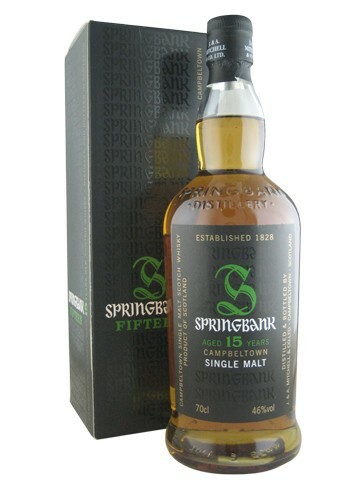 Springbank’s output never fails to impress and this sherried 15 year old really does the business. This is a complex dram but is really very pleasurable to taste and drink. The flavours roll around in the mouth and really come together even though they span everything from leather to sweet butterscotch fudge. My overall impression is Mellow! This has a great sweet/salt/bitter balance that incorporates the peat smoke, sea salt brine and fruit sherry flavours perfectly. A perfect dram to relax with after a hard day’s work.